Last week I bought an alarm clock dock for the original Kindle Fire. It's a model which was released by iHone several months ago, and while I would like to justify the purchase as being business related I really bought it on a whim (it looked interesting). I'm glad I gave in to the impulse because it turns out this is a much more interesting dock than I expected. It turns out that this dock, with a little bit of DIY know-how, can be modified to be used by any number of Android tablets or just about anything that charges off of a 5V USB plug. As soon as I got the ik50, i took it out of the box and started trying to take it apart. I soon discovered that the dock component of this clock radio was actually a removable insert which can easily be removed. iHome even encouraged this by including a second insert which lacks the plugs on the first one; this was included so you could set the Kindle Fire on its side in landscape mode. But what is even more interesting is that the insert which has the plugs uses standard audio and USB cables instead of some proprietary cables. This means that once I removed the audio cable, I could use this dock to charge my KFHD or any of a number of tablets. None of the devices fit all that well, so I'm not sure my work is worth repeating. But the way this dock is built makes it an excellent base for DIY projects. There are lots of Android tablets that don't have docks but do have headphone jacks and charge via a USB port. A sufficiently motivated and skilled individual could scratch build an insert which fit the IK50. Do the buttons on the dock work with other android tablets or is it limited to just charging the tablet? There’s one button on the insert which is positioned to work with the Kindle Fire’s power button. That won’t work with other devices, obviously. But the rest should work with everything else, though most of the buttons are only used for the clock radio. Basically once you plug this into the headphone jack of a tablet it becomes an external speaker. I think I’ll stick with my Altec Lancing computer speakers then. If it can’t control tablet functions then it’s basically just a clock radio with an external input. In your photos you show a Nook Color plugged into the dock. 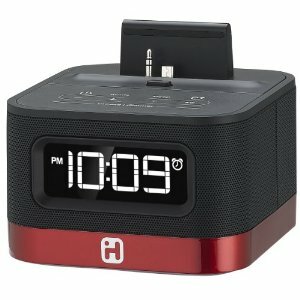 I’m curious if you were able to charge the Nook using the iHome dock, since Barnes&Noble used a custom USB connector on the Nook Color that is not standard microUSB. The NookColor uses the same USB plug as a lot of other gadgets and yes it charges. I see in your picture you was able to take the audio port out of the standard dock how can I do that without breaking the dock? With my dock the audio port was simply a standard audio cable. All I did was remove the dock insert, disassemble it, and remove the audio cable. Putting the dock insert back together again took a little fiddling, but it worked okay when I was done. Did some reading on Amazon and it sounds like this does not work with kindle fire hd. How could you get it to work if not the right size? I think I disassembled the stand, and then reassembled it. This post is close to three years old, so my memory is fuzzy.